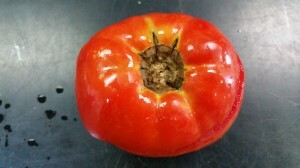 A fresh market tomato from a home owner garden was dropped off the other day with some strange internal rot. 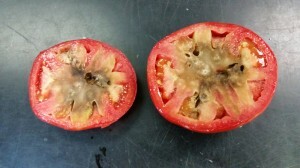 The internal rot (photo 1) was most likely caused by water accumulating in areas immediately around the stem and as the fruit developed growth cracks (photo 2). This allowed for opportunistic fungi and bacteria into infect the fruit causing the internal rot. As it turned out the home owner was using sprinklers to water their garden. As the season continues into the late fall, it might be worthwhile to slice up one or more of your tomato varieties that are prone to growth cracks around the stem just to check if this is happening in your operation – especially with heavy dews and the wet weather we have had recently.